If I did run, which I don’t, I’d be running fast. Still revising, still helping the folks with rebuilding stuff, still driving kids around. But! Been reading good books. Having a good time with Helen Harper’s Slouch Witch and the second book Star Witch. Both are a lot of fun. 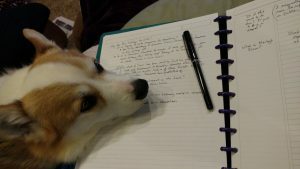 I also read a cozy mystery with a corgi. I’ll be reviewing that one soon. In fact, I have several reviews to get posted. Bitter Night is on sale right now for $1.99. Also, I’ll have a Horngate short story coming out in an anthology soon. I plan to do a give away of an arc shortly. I’ll put a note here and send out info in my newsletter. My parents are doing okay, though dad fell last week and ended up with a bunch of stitches in his lip and some serious bruising and lacerations. But he’s going to be okay. I’m actually posting this a day after I wrote the first bit because I’m totally fried. I have some cut bits that I want to post here. Stuff I couldn’t keep in the book but still love with all my heart. I’m dead tired now and so I shall go knit before bed. Salt Lake City still looked like itself, though now the sulfurous stench of the lake was replaced by fumes of tar. Shoftiel rolled down his window, sucking in deep breaths as his deprived senses rejoiced. The closer they came to the city, the more he realized that in fact, it had changed. One of the biggest changes came in the shape of jewel-colored drakes circling above, some carrying riders. Vines climbed up every building and dripped in curtains. Other plants clung to whatever surface they could find. Trees grew sideways with leaves from every color of the rainbow. Many of the building had turned into giant trees or tall pillars of salt. Others look like melted candles, some of which had molded together. While he watched, a squat brick lump of a building got up on seven thick yellow elephant-like legs and walked off toward the shimmering rainbow mountains, settling down on top of a broad, flat-topped place covered in brilliant scarlet fur. Or perhaps it was some kind of fairy grass. On the right, the tar bog spread out like a great, black quagmire. Heat waves rose from it, distorting the air. Hummocks and islands scattered thickly over its gleaming surface and boats poled through the tarways between. They continued south, passing the former airport. This was now a field of bushes. They were heavy with long, fuzzy pink fruits. Or vegetables. “What are those?” he asked, no expecting an answer. Giselle continued to play tour guide. Shoftiel’s curiosity was insatiable and he peppered her with questions. It’s come to my attention that the paper versions of Shadow City and Blood Winter have now become much more expensive. As in, around $22 dollars. I feel like I need to address this. First, you should know that I don’t have any say in pricing. I never had and doubt I ever will, unless I self-publish. It’s all up to the publisher. You might be wondering why, if the books originally priced at $7.99, why are they suddenly now almost three times that? To be honest, I’m not entirely certain. They will be available using Print on Demand (or POD) technology. I’m not sure what the costs involved in that are compared to the mass market price. It does seem strangely high to me, but again, I don’t know the ins and outs. I am just sorry that readers will be asked to pay such a high price. The price of ebooks remains quite reasonable, so that’s a positive. Unfortunately, the cost is higher to you, and also to me, insomuch as I can’t imagine a lot of these pricey books will sell. Trade paper is obviously more expensive. These will be of a trade paper size, I believe. I’m told that this is happening to a lot of books across the board, so a lot of writers are stuck with this pricing, though it’s the first time it’s happened to me. It also means that in time it could happen to more of my books. Anyhow, I wanted all of you to be aware of this, and also that authors have absolutely no say whatsoever in the matter. It’s entirely the publisher’s choice. I thank each and every one of you who spend your precious money and time on my books. I endeavor to the best job I now how to do so that it’s worth it.